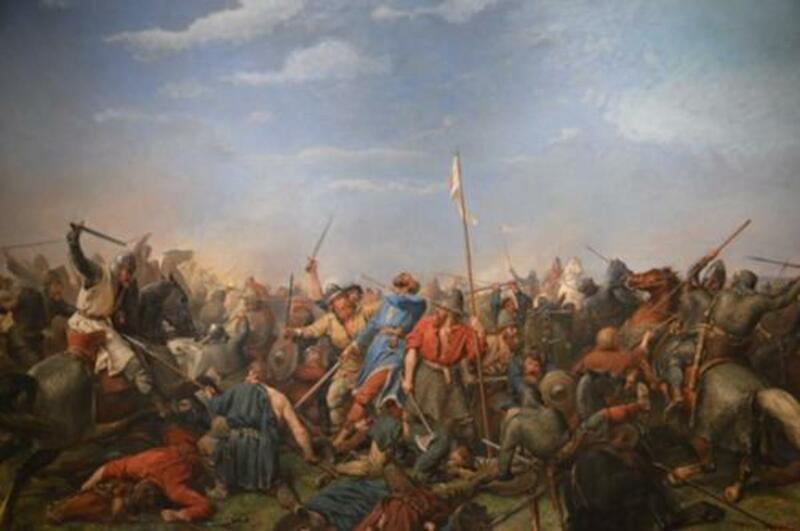 The painting above owes its inaccuracy to a misunderstanding by the Icelander Snorri Sturlusson in his account of the battle at Stamford Bridge near York. He may have misread accounts handed down verbally by Icelandic survivors and their descendants, who joined forces with Harold in the pursuit of promised pay in the event of victory. In keeping with English and Scandinavian tradition Harold Godwinson's men did not fight on horseback. His huscarls rode to battle and fought on foot whilst their mounts were kept safe, well away from the fighting. The horses might have been sold in the event of their owners' deaths to provide funds for widows and offspring. It was the Normans and their Frankish and Breton allies who rode into battle. Many of William's men lost their mounts in the heat of battle, both near Hastings and later at London Bridge. William had both his mounts killed from under him and tried to borrow one from Eustace of Boulogne, who refused him and was ostracised as a result. Imagery was as good as renown, carried before an army as a banner or standard. It was also a pointer to the quality of the leader before whom it was borne. Harald Sigurdsson showed himself to be of the old Viking breed with his Land Oda - 'Land-Waster'. Harold's own banner was the Cerne Abbas giant - true, a comic sort of character, never underrate its owner...! William had his raven banner, he also had the Pontiff Alexander's gold cross of Saint Peter to set the tone - and put his aims plainly - and let everyone know his purpose in England. Harald Sigurdsson, 'Hardradi' or 'Hard Ruler' - was hungry for renown, the spoils would pay his retainers. 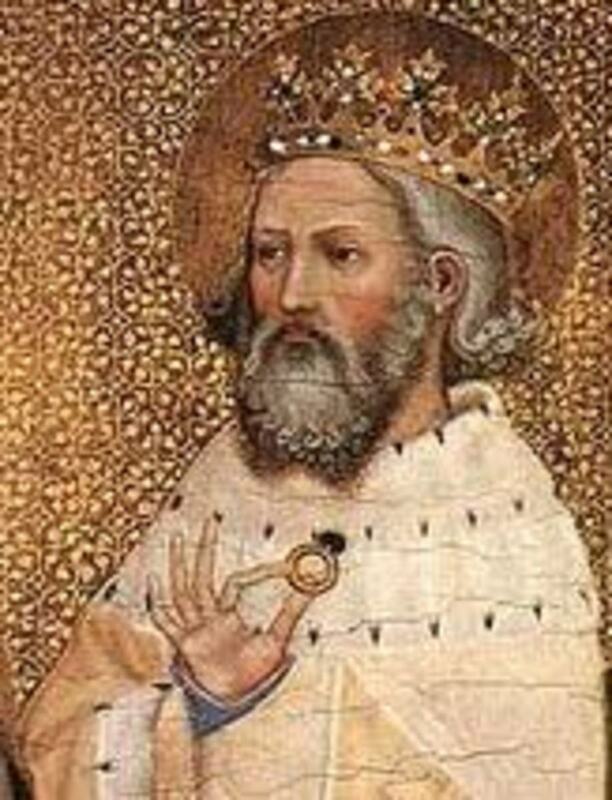 His nephew Magnus - deceased - had agreed a treaty with Knut's son Harthaknut - who died earlier in 1042 - whereby either king who outlived the other, or his successors, would step up to the throne of England, regardless of who already wore the crown. That was the basis for 'Hardradi' joining King Harold's brother Tostig in the late summer, 1066. The rest, as they say, is history. A thoroughly researched work of historical fact in my own library I have used for my own research on the RAVENFEAST saga series. ... William's second battle very nearly was his undoing. Had news spread around William's force of his defeat at London Bridge, who knows what could have happened. As it was the survivors of his Norman cavalry who tried to break the English shieldwall stayed tight-lipped about the fracas, ashamed of their lacklustre performance against the Middlesex fyrd led by survivors of the battle on Caldbec Hill. 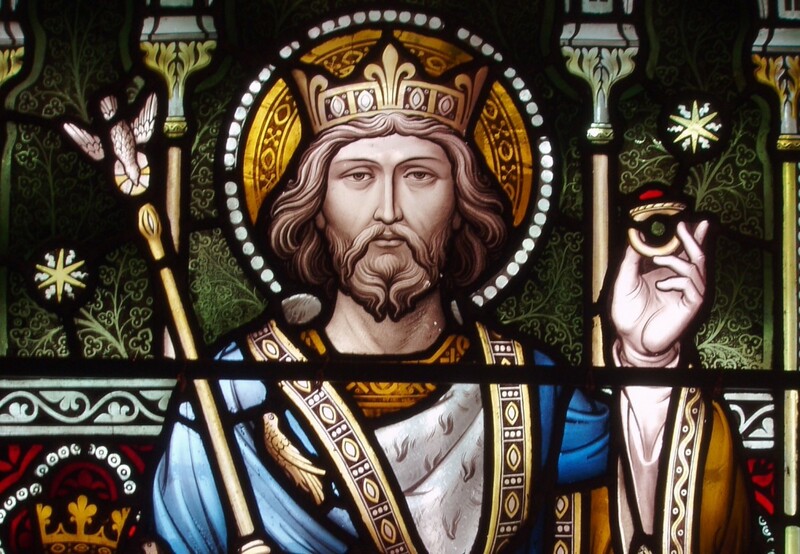 They were led by a young, untried and uncrowned King Eadgar. There were many local Saxons who had not been with Harold, who fought and died in this almost unknown pitched battle against six hundred of William's best knights. Many more lived through it and would fight again, elsewhere - perhaps in the west in 1067 under Eadric 'Cild', otherwise known as 'the Wild' , later in the year at Exeter. In the North in 1068 and 1069 there were more risings against Norman rule, and in the east in the winter of 1070-71 under Hereward and Earl Morkere. Then William took on Malcolm III 'Canmore' in 1074 - and Eadric 'Cild' was on his side. On September 20th, 1066 the first of four major battles took place at Gate Fulford, to the south-east of Eoferwic/Jorvik.Here was the confluence of the River Ouse and a system of drainage ditches. Defending this, the heart of his earldom was Earl Morkere and his older brother Eadwin, the earl of Mercia. Attacking was the deposed Earl Tostig, with the Norse King Harald 'Hardraada ' Sigurdsson and a huge army of mixed Norse, Danes and Flemings. The Norsemen came from all over Harald Sigurdsson's maritime empire, Orkney, Shetland, Iceland, Man, parts of Ireland, the Faeroes and not forgetting the land we now call Norway itself. 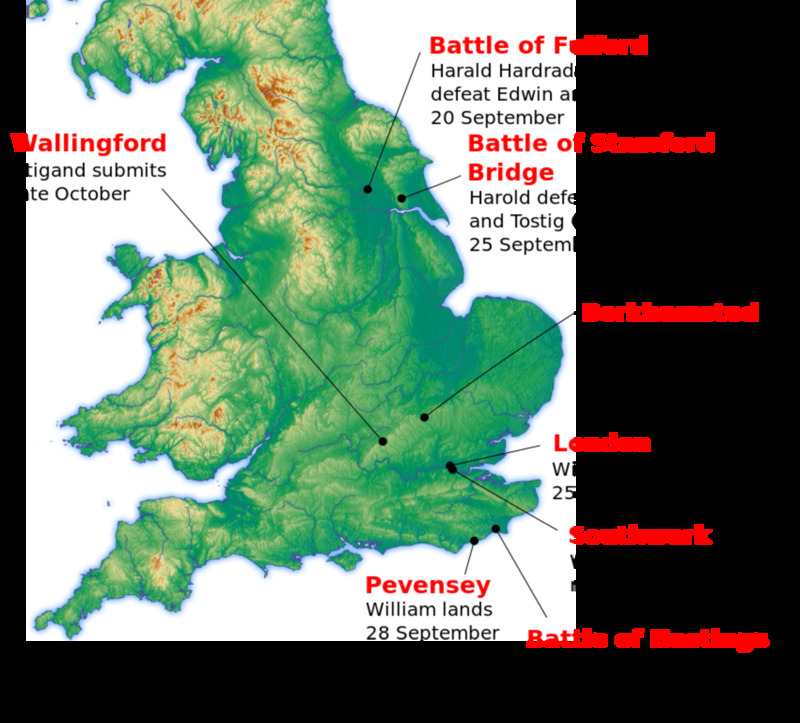 However, this battle and the subsequent struggle at Stamford Bridge should never have taken place had it not been for King Harold's inability to come to a compromise at Northampton a year earlier. Tostig had been visiting his sister, Queen Eadgytha and brother-in-law King Eadward when he learned that the men of his household in the Earlsburh at Eoferwic had been killed to a man by rebels seeking to oust him and instal Morkere as earl of their own choosing. They followed up the attack on Tostig's household at the Earlsburh with one on his property in Northampton. 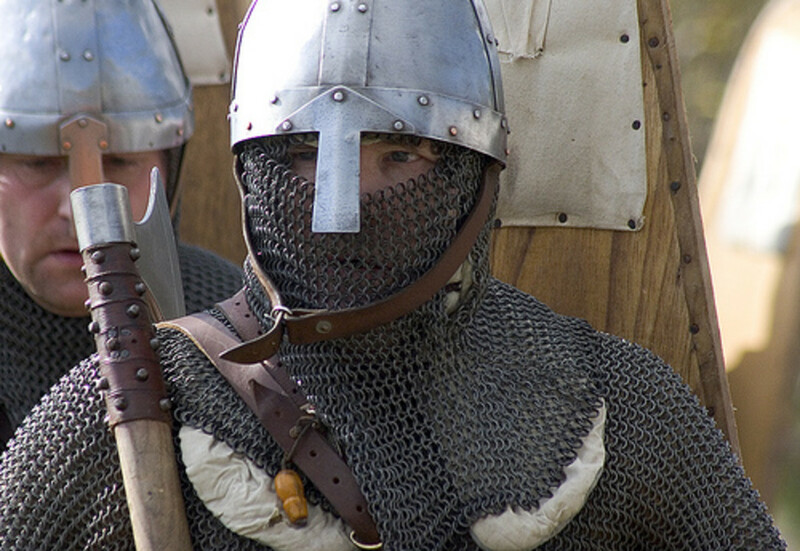 As Tostig's brother and senior earl of the kingdom, Harold was asked by Eadgytha and Eadward to talk with the rebels and the Earl of Wessex rode to speak with Morkere, Eadwin and the Bamburgh clan to no avail. Both sides were adamant, Tostig on the return to him of his earldom, the rebels on throwing him out. Tostig was offered another earldom, but refused, insisting on keeping Northumbria. He accused Harold of not supporting him to his best ability, of complicity with his brothers-in-law (Harold had married their sister, the widow Aelfgifu not long before) and left England. He wanted outside help to regain his earldom, accused as he was of graft and plotting to murder. The charge of graft levelled at him was in respect of pocketing much of the tithes collected from reluctant Northumbrians. The collection of tithes had been entrusted to the Anglo-Danish Copsig, scion of a powerful family in Deira (southern Northumbria, between the Tees and the Humber - now Yorkshire). Copsig was hiding, out of reach and nowhere to be seen, perhaps sheltered by his kinfolk. 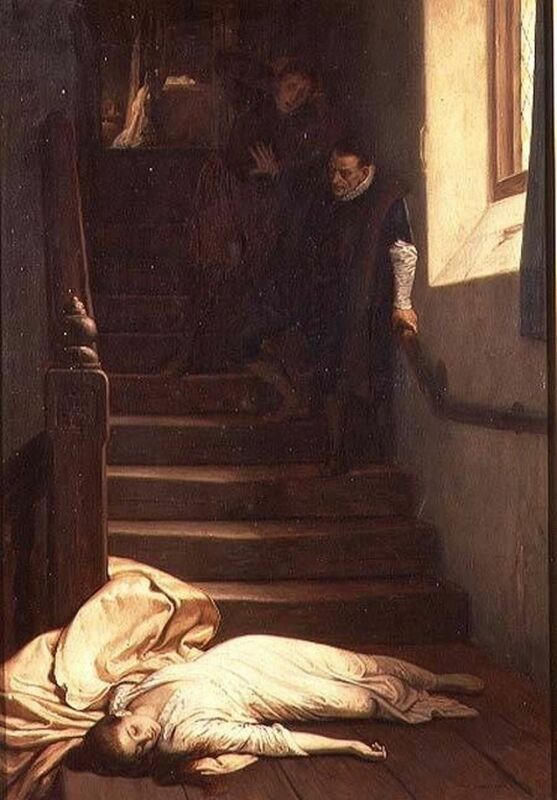 The murder of Gospatric, scion of the house of Bamburgh and kinsman of the later earl of the same same, had been arranged by Eadgytha when the young man was in her care as hostage to his family's good behaviour following another classic Northumbrian rift. Lawless Northumbria was, its nobles believed, beyond the rule of a mere Saxon king ruling from Winchester. First Tostig went to Scotland for help, to the court of King Malcolm 'Canmore'. Malcolm did not feel able to take on Harold, but afforded the loan of ships and crews. So Tostig went overseas for help to regain his earldom, first to Normandy. Duke William had his own eyes on the English throne, believing himself to be his kinsman Eadward's heir and not Tostig's brother, Harold. Many, even in England, believed Harold had usurped the throne on the old king's death. Count Baldwin V of Flanders was Tostig's brother-in-law. Bruges was he next stop along the way. Baldwin, brother of the Countess Judith, was of the same opinion as Malcolm, that he felt unable to challenge Harold, but gave Tostig men. With his surviving Anglo-Danish and Danish huscarls Tostig went on to the court of his distant kinsman Svein in Roskilde. Svein was evasive. He had survived being hunted down through his own kingdom by the giant Harald Sigurdsson, and did not feel able to take on another military giant, Harold. Besides, they were kinfolk, were they not? He drew Tostig's attention to a treaty agreed between the now dead King Magnus, Harald Sigurdsson's nephew, and Svein - more of a gentleman's agreement - was that whichever one of the two should survive the other should see themselves free to claim the throne of England on the basis of descent from the mighty Knut (Canute/Cnut). As he, Svein did not feel up to invading England, Tostig should try Magnus' successor, Harald 'Hardraada '. King Harald's men had been accusing him behind his back of going 'soft'. There had been no new expeditions since the last time they set foot on Danish soil, no new loot to share out. Harald was all for an expedition to claim England. Planning the expedition took little time. 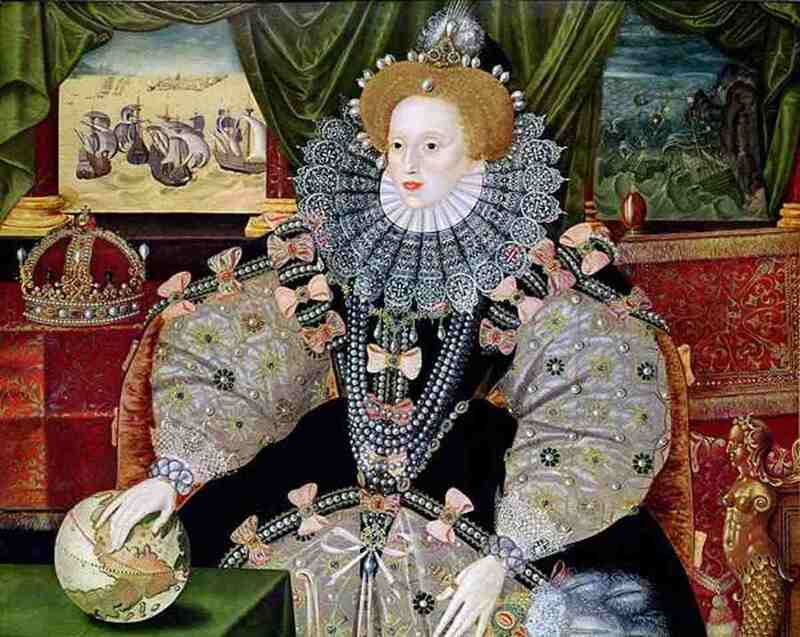 Ships were available, as were the men of his dominions across the seas around Britain and the broad ocean. Meanwhile Tostig took his ships back to Flanders, set off for England and raided around the coast between Kent and the Tees before meeting up with Harald Sigurdsson's fleet off St. Abb's Head on the seaward side of the Firth of Forth. Tostig had lost men on his raids, the biggest losses having been suffered on the Lincolnshire coast. He was in a foul temper when his men raided the Northumbrian coast again on their way to the Humber. Skarthiburh (Scarborough) was sacked despite the people there also being of Norse descent. Another 'blooding' raid was launched in Holderness before the fleet turned Spurn Head into the Humber and beached at Riccall. From there they marched overland to Gate Fulford, smashing through the combined fyrd forces of Northumbria and Mercia and threatening York. The people of York gave Harald Sigurdsson a heroes' welcome - the same could not be said for Tostig, but he was thirsting for revenge. The city fathers were less welcoming to either of them, but had to yield to demands of hostages and gold. They would wait, Harald Sigurdsson foolishly told them, by the banks of the Derwent at Staenfordes Brycg Stamford Bridge. At that time King Harold, his younger brother Earl Gyrth as well as Earl Waltheof and other nobles were on their way north with an army. The feckless brothers, Eadwin and Morkere had not sought their own king's help against the Norse king when they knew they were about to be attacked. He would have to upbraid them before taking on Tostig and Harald 'Hardraada ' . On the morning of September 25th. when they spied dust on the western horizon beyond the ridge, Harald and Tostig brightened, thinking it was the hostage party with their 'pay-off'. When the dust cloud grew they knew they had erred! Before long Harold's army was lined up atop the ridge above the wooden bridge opposite the burnt-out hamlet of Stamford Bridge and the long hill on which the main body of Harald's men rested. Amid the body of seasoned warriors was their king's raven banner, 'Land-Oda' . A troop of about a score of Harold's men rode across the bridge past the stupefied Norsemen, still only half awake from carousing into the night after their victory. They rode up to Tostig under the watchful eyes of thousands of bemused Norsemen, Anglo-Danes, Danes and Flemings. One spoke out, asking for Tostig Godwinson. They spoke for a short time. Tostig was heard to ask why the rider offered land now, after so many men had already been slain. When asked by Tostig what Harald sigurdsson hoped to gain in land, he was told, '... Seven feet of ground, or as much as he is taller than other men'. Tostig haughtily told the rider he would hold with the Norse king and the party of riders left to cross back over the bridge. Not understanding English 'Hardraada' asked who the rider was as he rode away. On being told it was Harold the norse king said of him that although he was fairly lacking in height he stood well in his stirrups. When he asked Tostig what had been offered in return for leaving the battlefield he was told Harod's words, according to the Icelandic scribe Snorri Sturlusson in his Saga of Harald Sigurdsson, Harald angrily retorted that he could have killed the insolent Harold. 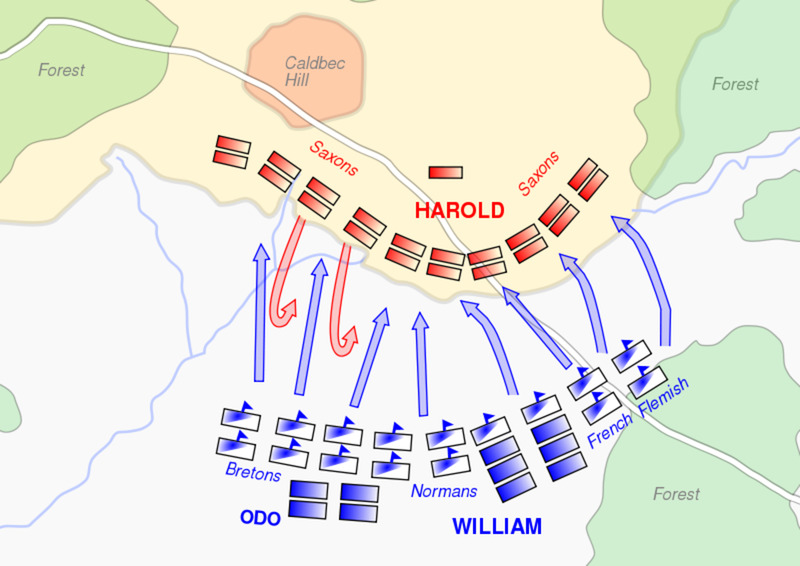 A number of men were on the wrong side of the river and came under attack from men under Harold's command. They fled eastward across the bridge, defended by another Norse giant armed with an axe. This giant despatched several of Harold's more foolhardy huscarls before one ingenious fellow took a small boat under the bridge, speared the lone Norseman from below and the English stormed across. 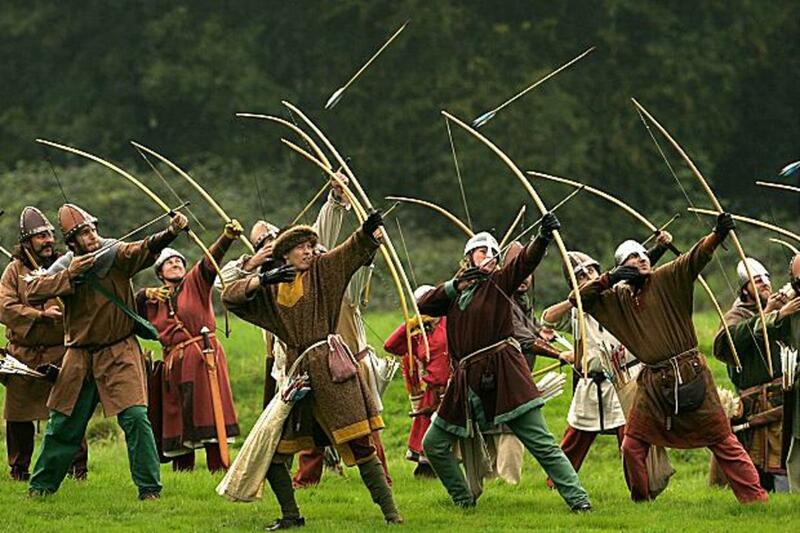 A hail of arrows came down on the surprised and poorly protected Norsemen and allies. Their shields sehold). King Harald Sigurdsson, 'Hardradi' fell to an arrow through his windpipe early in the battle and Harold's disaffected younger brother Tostig was left in command for a while with Styrkar, one of Harald's two stallari (field marshals). 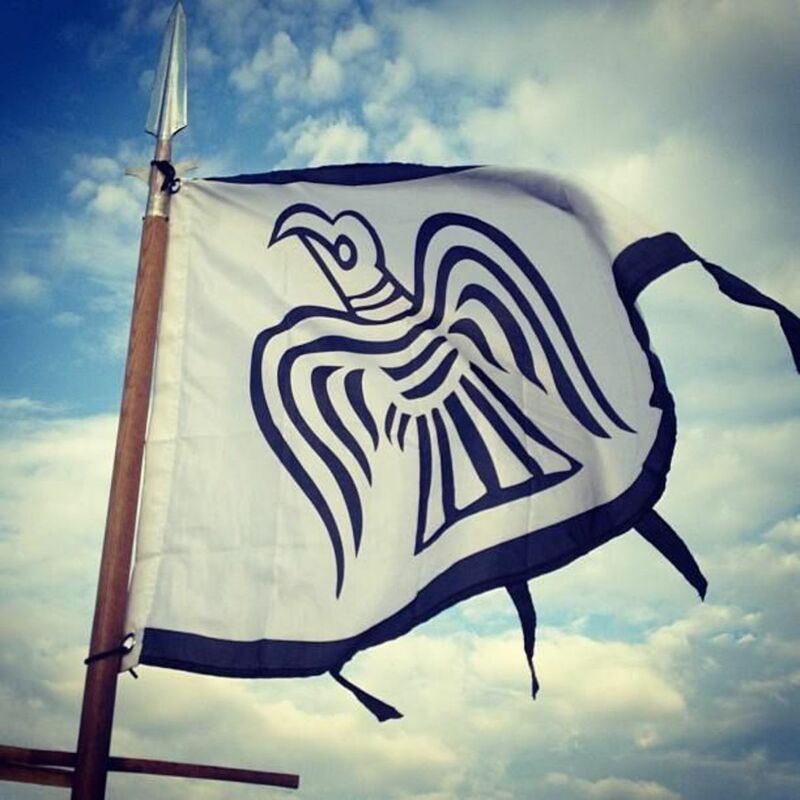 Half the army and many weapons, shields and mailcoats had been taken back to the ships with Eystein 'Orre', and they were hard-put to repel the first wave of Northumbrians, Mercians, Anglo-Danes and Danes (Harold's huscarls) and West Saxons (also of Harold's household). When Eystein, the elder of the two marshals arrived from Riccall with reinforcements many of them fainted from heatstroke after jogging six miles from the ships in chain mail, carrying shields and weapons. Eystein collapsed and died before even one arrow hit the ground near his dead body! The rest were routed and chased back to the ships. No quarter was given in revenge for the slaughter at Gate Fulford until, blood-thirst sated, a few were left alive including Harald's sons Olaf and Magnus. When they ha given their assurance that they would never attack the kingdom again during Harold Godwinson's lifetime they were allowed to sail, to take their grieving mother Thora home from Orkney. Only a couple of dozen ships were needed to take the survivors home, most of the rest burnt at the riverside where they had been beached. At the victory feast in York Harold learned from a rider that Duke William had landed on the south coast and was ravaging in a wide circle around Pevensey, Dover and Hastings, destroying crops, stealing livestock to feed his men and hay for his horses. Harold now had another week-long ride back to London to call on his southern fyrdmen again. With his both his younger brothers, Gyrth and Leofwin and their men - with more gathering to follow on - Harold moved on the south coast. He was advised that Duke William awaited him at Hastings and headed there to block the London road on the ridge of Caldbec Hill by way of the southern end of Watling Street and the tracks through the Andreds Weald. Many men met him at the Hoar Apple Tree above Hastings, the gathering place of the Saxons since before his grandfather, Thegn Wulfnoth's time. More were coming to join them all the time. However, before he could move further down into Hastings to cut William off from the only way north off the peninsula, William's scouts had advised their duke of the Englishmen's proximity. On the Saturday morning, September 14th, 1066 Duke William's Normans, his Flemish, Breton and Frankish allies and paid men showed through the trees on Telham Hill, opposite Harold's incompletely mustered forces. They were numerically evenly matched, but William had three advantages: firstly he had cavalry - the English, like the Normans' forefathers and all northern armies, rode to battle but fought on foot, he had right on his side - having talked half the crowned heads of Europe that Harold had gone back on his oath to him to uphold his claim to Eadward the Confessor's crown, and he had weapons unknown to the rest of the northern world - his cavalry carried lances, his infantry carried crossbows and ballistas for throwing bigger stones than the South Saxon slingers would have. He also had a black stallion given to him by Alfonso, king of.Asturias, and the Pontiff Alexander's golden cross standard borne by Count Eustace of Boulogne. Saxons yelled abuse at Normans, insults went back and forth. 'Ut! Ut! Ut!' the South Saxon fyrdmen roared, 'Out! Out! Out!' The Normans sang the Song of Roland, about the ill-fated son of Charlemagne who faced the Moorish army at Roncesvalles in the Pyrennees two hundred or so years earlier. English monks sang, Normans returned with the 'Carmen ' . At 'Terce ', the third hour - nine o'clock in the morning - the bells of a nearby chapel chimed. Battle commenced. The Bretons were urged forward by their leader, the Breton count Alan's cousin and namesake Alan Fergant , or Rufus. A barrage of thrown axes, rocks and arrows rained down on them. They faltered and ran, crashing into the Norman cavalry sent to bolster them. Some of the local fyrdmen chased after them behind their thegns . William watched this closely. He saw that of all Harold's men, these were undisciplined. He himself was unhorsed twice, and the battle was almost lost to the panicking Normans, thinking him slain, until he lifted off his helmet and yelled that he was alive. They rounded on the pursuing Saxons, cutting them off and killing them all on a hillock near the foot of Caldbeck Hill were boggy ground hemmed them in, the bravest lasting only minutes longer against flails, lances and maces.And so it went on until early in the afternoon. The English shieldwall was still very much in place, bolstered by Harold's well-disciplined and seasoned huscarls. 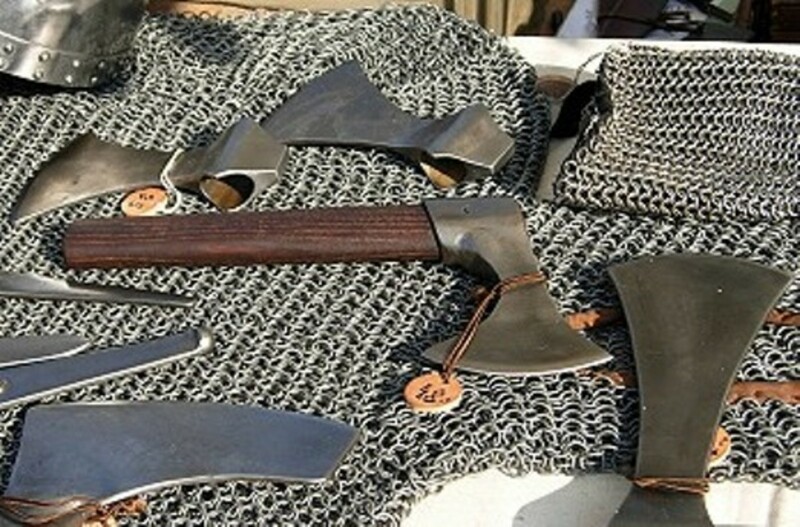 Earlier his brother, Earl Leofwin had been cut down by the Norman cavalry when venturing out beyond the shieldwall in daring axe attacks with his men, their heads and backs covered by men with shields and spears. Earl Gyrth fell to a crossbow arrow before a truce was called to take food and water to the thirsty, succour to the wounded and prayers for the dead. Fighting began again. The light was still good, and the shieldwall still bore up against repeated showers of arrows, infantry and cavalry onslaughts by Normans, Franks, Bretons and mercenaries. The light was beginning to fade, William knew he must break the deadlock or lose his advantage - and perhaps his own life to his men. He remembered the rushes made by the unruly South Saxons against his retreating and fleeing men. He sought to draw them and gained the upper hand. The shieldwall was thinning, all the time nevertheless being reinforced by new arrivals. Harold was wounded in his face by a stray arrow, yet fought on after his wounds were dressed. William's men gained the top of the hill, a feat in itself because the grass was bloodsoaked, covered in gore and the dead and dying of both sides. 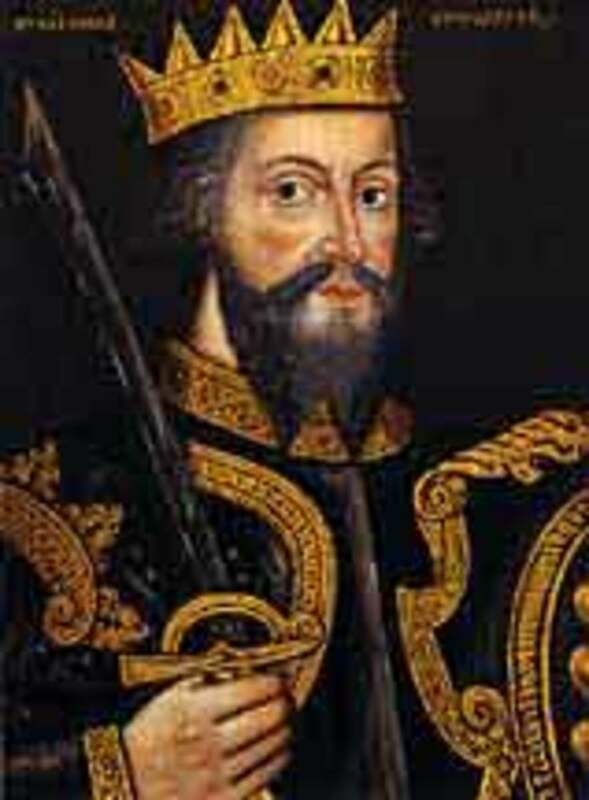 Harold was beset by three of William's knights, taunted and hacked at by them, and finally killed. His huscarls and king's thegns stood their ground even now, killed beside their stricken king. All others fled, pursued by William's cavalry into the darkening woods. Even now men came, although when told of Harold's death they too fled into the gathering darkness of the Andreds Weald. Some were pursued into a ravine to the west of the hill, where they turned on the Normans, killing some. wounding others. Harold's nephew Hakon survived somehow, as did Ansgar, the shire reeve of Middlesex and Harold's stallari. Taken for dead by their own men, they fled in the darkness and headed for London. The Witan elected the aetheling Eadgar as their king when news of Harold's slaying reached London. Those earls who had not gone with King Harold to take Duke William to task now vowed to acclaim Eadgar as was his due. Eadward's heir was not William, they said - nor had it really been Harold but although he had been a strong earl and the leading man in the kingdom, many thought he had usurped the crown. Earls Eadwin, Morkere and Waltheof readied themselves for a certain head-on collision with William. 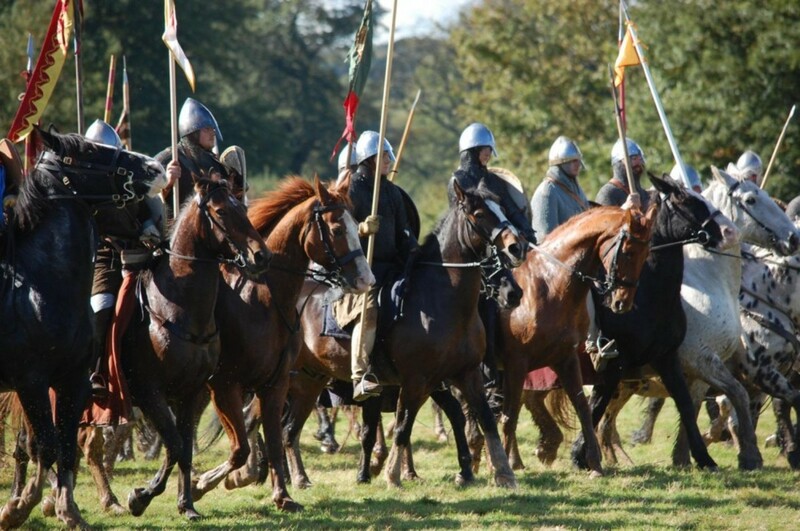 News came that William was on his way through Kent at the head of a six-hundred strong force of mounted knights. He was coming to London to make his claim! Eadgar led the London thegns and fyrd with Ansgar and Hakon, as survivors from Caldbec Hill. Close behind the new king came the young earls, thirsting for Norman blood - as they had thirsted for Norse blood at Stamford Bridge. William showed late in the morning with his knights, tried to talk his way out of a fight, but finally had to admit that talking was pointless. His knights crashed against an unmovable shieldwall time after time with heavy losses on William's side to arrows, slingshot, thrown axes and spears. The road ran red with Norman blood! They resorted to setting the houses of Southwark on fire, and talks at the onset of dusk again led to nothing. A final assault on Eadgar's shieldwall lost William more men and they left, shamed, under cover of darkness. This was Eadgar's hour of glory! He had proved himself a leader of men, had he not? 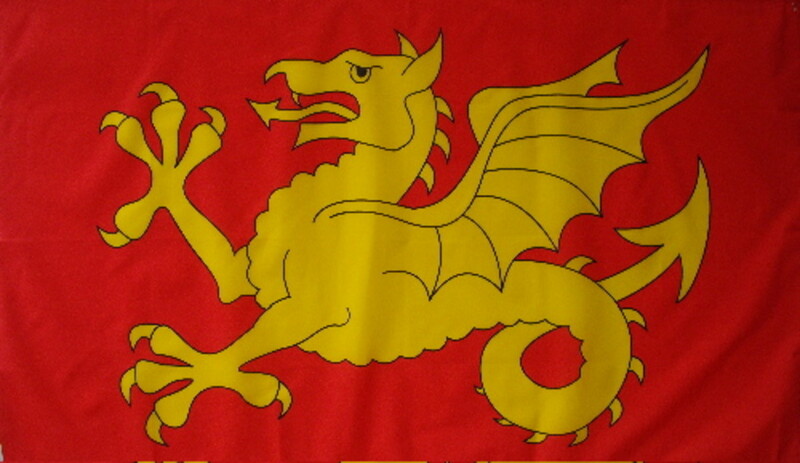 Wessex Wyvern, Harold's main banner. His 'Fighting Man' banner was sent as a memento to the Pontiff Alexander in Rome. It's still there. 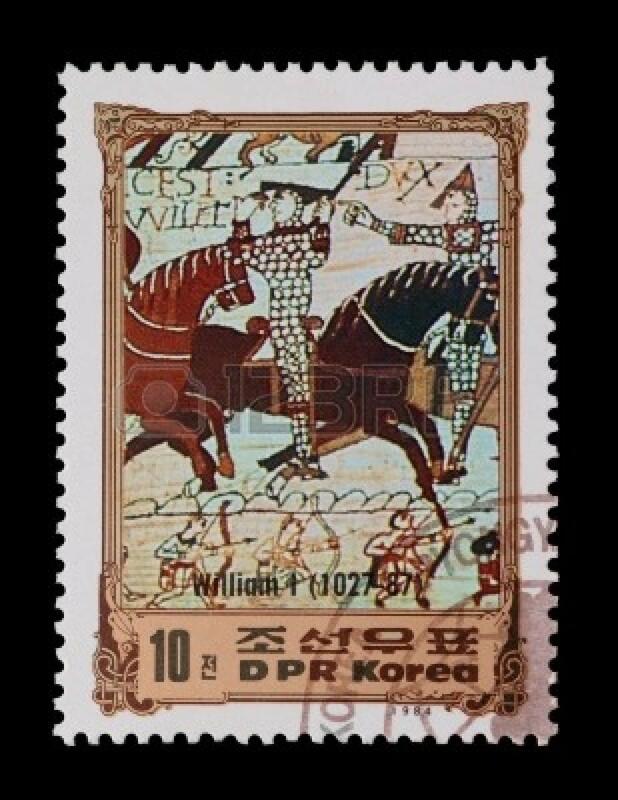 1984 Korean postage stamp issue commemorating Duke-King William's life - is this what Kim-Il Sung aspired to? 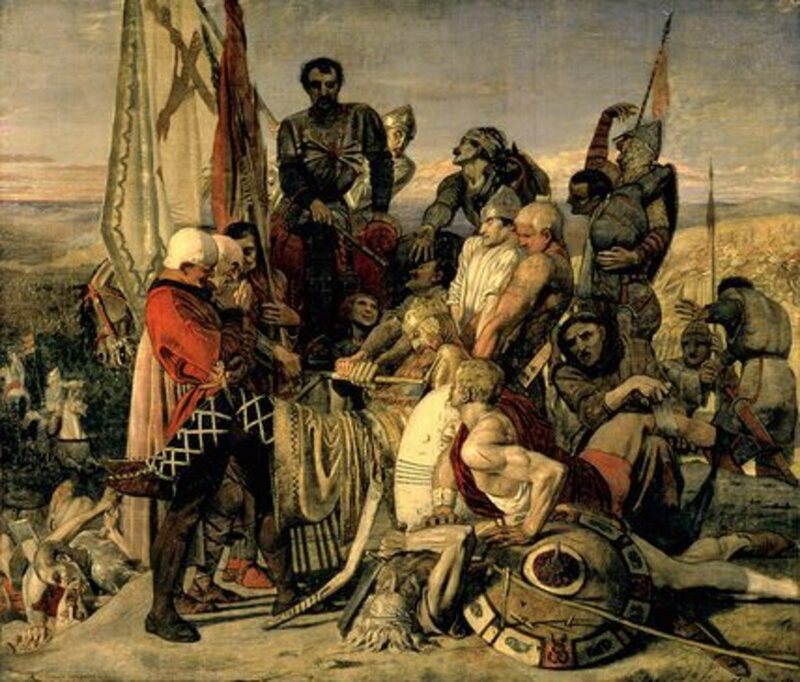 Conquest - 2: Farewell to Legend - Harold's Entombment at Waltham, Fact or Myth? Who was to blame for the fall of the Anglo-Saxon empire in 1066? Conquest - 25: A Norman Duke Thought He Should Be England's King, How Was That Remotely Possible? This was an interesting Hub, I loved it. If it wasn't for William's domesday book many of us genealogists wouldn't be able to go back very far on family history. It is interesting to read how he was able to make it all happen.